SEP. 04. 2011 about Disney's Halloween! AUG. 12. 2011 about the enhancer for a food counter. JUL. 25. 2011 about more details of the "Jasmine's Flying Carpets". JUL. 18. 2011 about the "Jasmine's Flying Carpets". JUL. 12. 2011 about the "Cool the Heat". Most exciting season comes in TDL, it's Disney's Halloween. In this year 2011, this event will be held from SEP. 4 to OCT. 31. The park is a very Halloween atmosphere, in the evening, each light is on, creating more fantastic atmosphere. Some popcorn wagons have a Halloween decoration. In World Bazaar, at "The Disney Gallery", there are Disney character drawing classes (Sorry, Japanese language only) for a fee. During this Halloween season, "Vampire Mickey" class has started. After the class, you can bring your drawing with the original plastic case. Why don't you try it? The fee is 500 yen per person for 30 minutes class. In this season, the "Haunted Mansion" was changed as "Holiday Nightmare" by Jack Skellington. There are many Halloween merchandise has launched include pins. Here are the "Welcome to Spooky Vil." the special Halloween parade. In this song, the word "obake" means "ghost" in Japanese. Go to wonderful Halloween Costumes 2011. If you decided what you eat in the park today in advance by a guide book or some reviews, it's OK. However, I think it is a serendipity that if you have a good meal at the restaurant which you happened to stop by. That is the park biggner's privilege. For the last few years, the food facility which is located in an obscure place or unrecognizable as a restaurant have a Cast Member who stood and directly appeal the own restaurant's specialty to the guest. And the handy food like a tortilla wrap sand or churro were introduced by the Cast Member. The food enhancer Cast Member is a good way to find the snack quickly without the pain which scout out for the food under the scorching sun. However, it reduce the fun as was described earlier. In my opinion, there is one good point of the food enhancer Cast Member. It's plastic food sample. The Cast have a plastic food sample of the speciality, therefore as a food sample lover, like me, it is a nice opportunity to look closely at it. It is a happy moment for me and food sample lovers. A new item "Food Sample" at Pick Up Obsessiveness coming soon! The picture from the latest TDS guide map. The very end part of the Arabian Coast, this is the place where opened the new attraction "Jasmine's Flying Carpet". In this attraction, guest can go through with the stroller. Therefore, the queue is very wide than other attraction. There are a stroller parking in the queue line. "Park it then return the queue." The photo No.1 is the right side of the carpet. Guest get into this ride on this side. The other side, No.2 is the left has an arm on the center of this carpet. These are the back side and front side of the carpet. You can find the front-mounted round shaped thing that is the control lever. The front row's lever can change the carpet height and the back row's ones can change the carpet tilt. There are no opening pins of this attracton, it made me sad. Only launched the sticker and button. Here are the more geeky video about the "Jasmine's Flying Carpets". 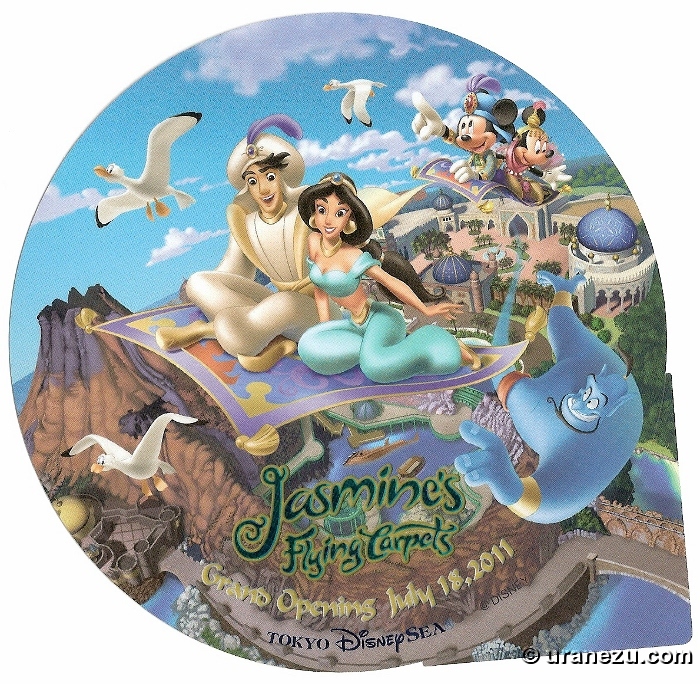 The new attraction "Jasmine's Flying Carpet" in TDS will be open on 18 JUL. 2011. This ride attraction is which guest can enjoy soaring over the Jasmine's garden. Here is a quick report of the attraction during sneak preview. There are a pair of golden guardian tigers at the entrance. It is an elegant looking. oops, one of them is not a statue, it's a Rajah! So cute! This attraction is hosted by NTT Communications. Your favorite friends from "Aladdin" on the tile wall in the queue line. The ride capacity is four-seat per carpet which 2-seat X 2-rows. We can driving own carpet up to about max. 5 meters from the ground. Also guest can change their carpet tilting back and forth. The front row's bar can change the carpet height and the back row's bar can change the carpet tilt. Would you like to take a picture or videotaping of your family flying? Adjacent to the attraction is a nice place, "Balcony Viewing Area". We can see the flying carpets up close from there. Here are the ride video and view from the Balcony. The eye-catching object except the flying carpets is a peacock water fountain on the top. Actually, it is not a fountain, because it isn't use any water. The device is composed of two wavy aqua colored board (I am not sure the material is acrylic or glass.) pasted together and they rotate in opposite directions. I heard some bad evaluation about the peacock fountain(?) is cheap device. But, I love it. I was impressed about the idea. And this device registered trademark, wow! You can find this on above video at 2:54 & 3:35! Location : Arabian Coast in TDS. The "Cool the Heat" season has come again in TDL. The "Cool the Heat" is the daytime summer castle show which has started in 2006. It may be said that the "Cool the Heat" is a must-see show in TDL Summer Program. The most selling points of the "Cool the Heat" is the usage of the water. There is a matter of difference in national character of "getting wet". The below photo is an example for this. The sign from the queue line of the "Splash Mountain". The sign says "You may GET WET" in English. The above of this, white character in Japanese shows "Sorry if you get wet". In consideration of this, TDL "Splash Mountain" is less splash than other two parks'. However, only this show, every Japanese eagerly desire to get wet. Look at the above picture. It is not rainy day, it is just a very cloudy. The picture looks like a mist, but actually, it is an immense quantity of splash. In weather like this, many guests in front of the castle stage were happy to get soaked. The tons of water shoots from the stage of course, and in addition, the two towers beside the stage also shoots a large number of water to the guest. The scene in which the water shoot into the air from the turrets is spectacular. Sometimes depend on the weather and show times, we can see the rainbow of this show water. Please come and get soaked! TDR Summer Program has started today, and it run through until OCT. 31. Here are the first glimpse of the Summer Program in TDL. "Cool the Heat" is the daytime castle show which use a large volume of water. In this year the show's setting changed. I will report more about this marvelous splashing show later. Please wait for a moment. First, buy a treasure map with a bandana then let's explore the park and get the "A Sign of True Pirates". You can get the map at the "The Godlen Galleon" or "Pirate Treasure" the merchandise shop in Adventureland, the price is 500-yen. There are Mickey-shaped pattern and TDL logo on it. I remember the first appearance of this kind paid game in TDL was the "Egg Hunt in Tokyo Disneyland" which was held in 2010, "Disney's Easter Wonderland". I think that that "Egg Hunt" game is one of the booster program in the TDL Easter event. I was impressed that many splended Disney character eggs hid various places with beautiful vegetation. I think that the most Japanese would have considered the "Egg Hunt" in the park as just a paid activity with a small gift of TDL. I have no idea the OLC understand and made use of the situation or not, the same kind of the paid game which is no relation thing like the Eater and the Egg Hunt. And the reappearance of this paid game in TDL is not agreeable for me. "Naminamina" is the child-friendly show. The show has a dance time with Disney characters at the below spot. "Naminamina" will be presented at different locations depending on show schedule. So please be careful if you would like to dance! Location "Westernland (Parade Route)": 12:05a.m., 6:15p.m. Today, the Aladdin unit include Genie float and a Palace float with Aladdin & Jasmine debut! In World Bazaar, at "The Disney Ga rally", there are Disney character drawing classes (Sorry, Japanese language only) for a fee. During this summer season, "Pirates Mickey" class has started. After the class, you can bring your drawing with the original plastic case. Why don't you try it? The fee is \500 yen per person for 30 minutes class. I found the FAB 5's wishing card hang on the main bamboo tree. Their cards are very high avobe, therefore I couldn't read what they write on it with the naked eye. Here are the video of the "Tanabata Greeting". Disney's Star Festival is being held in TDL from JUL 1st through 7th. This annual event related with a Tanabata festival. There are typical Tanabata decoration, bamboo wishing tree in World Bazaar. In Japan, we celebrate this day by writing wish and hang it on the bamboo. 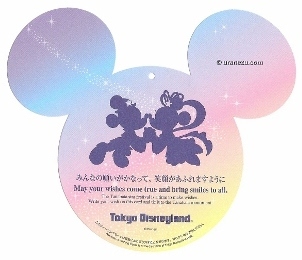 The below picture is wishing card at TDL instead of the Tanzaku, the small rectangle paper. Let's write your wish on the card and hang it on the wishing corner. The card says, "May your wishes come true and bring smiles to all. The Tanabata star festival is a time to make wishes. Write your wish on this card and tie it to the Tanabata monument". Yukata casts are going to give you a wishing card. This event has a special greeting "Tanabata Greeting" which character dressed up as a Hikoboshi and Orihime from the Tanabata story. Hikoboshi Mickey and Orihime Minnie ride in a rickshaw (Jinrikisya), therefore they are lower than a nomal parade froat. It is difficult to take their picture. Here is my bat out collage. This "Disney's Star Festival" is one week event, however there are quite various kind of items have launched. For example, the sticker, key chain, below pin and so on.